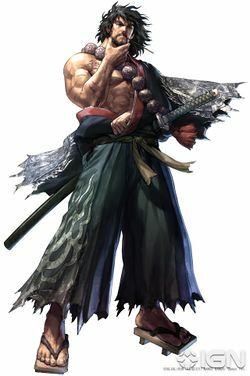 In Soulcalibur, Mitsurugi is a very good all-rounder, easy to learn and one of the most popular characters. This guide is not intended to be a moves list with a description of each move. The best way to learn is to adopt a strategy of knowing what moves to use in different situations and what moves combine into effective strings. At the start of a round, both players are a certain distance away from each other. The first hit is very important. In some games like Street Fighter 2, you get extra points for the first hit. Getting off to a good start can mean that your opponent might completely lose his/her concentration, and if you follow this strategy you can end the round quickly with a series of attacks. Run towards the opponent and perform a delayed HEAVEN DANCE ( + , pause, ). If they block the first hit then normally they would drop their guard, thinking you were done, and the second hit has very high priority over most attacks and should connect. Fully crouch and wait for them to run at you with an attack. If they don't move, then duck and keep edging forward. If they try hitting you with a long attack, then just block and keep waiting. As soon as they run up to you execute CLOUD DIVIDE, COLD STITCH ( + ). This again has very high priority. Immediately perform the SHIN SLICER ( + ). This is one of Mitsurugi's main moves and has good reach. It may be cheap, but you need it to win. Go straight into an 8-way-run and execute TROOPER ROLL ( + ) which is very surprising. Far: HEAVEN DANCE ( + , pause, ). Always a good move to use. Far: SHIN SLICER ( + ). Use this when alternating between high and low attacks. Far: BULLET CUTTER ( + ). This is Mitsurugi's main attack. Close: CLOUD DIVIDE, COLD STITCH ( + ). Close: STALK SHAVER ( + ). Fast, but don't use it too much. Close: HEAVEN CANNON ( + ). This move launches the opponent into the air for a juggle opportunity. OBEDIENCE ( ~ ). Good as an un-blockable after a spirit charge. SHIN SLICER FEINT UPPER ( + ) and go on to a juggle. The next four sections explain other ways of knocking the opponent down. This stance is mainly used by pokers. The best way to get into the stance is by tapping and holding . Once in the stance, you can poke with the button or press , for a modified throw or for a very fast sweep. A good strategy is to use the sweep after STALK SHAVER. For example, after parrying, try STALK SHAVER ( + ) ⇒ hold then press . After the STALK SHAVER, Mitsurugi will go straight into MIST and sweep. Useful for following up and taking off a little bit more energy. This stance is very good. The best way to get into it is by doing the first part of HEAVEN DANCE ( + ) then holding down the button until Mitsu changes into RELIC. Going into the stance this way pushes your opponent back and gives you time to charge up for PATH OF DAMNATION (Hold + ). If the opponent starts running at you, then release + immediately for an unblockable High attack. If the opponent freezes or moves away, then charge up for about 2 seconds then release for a double low unblockable. Good to use on a cornered opponent. Juggles can easily be escaped, so after the launcher you're only guaranteed one hit. However, some players don't know how to escape a juggle or just let go of all the buttons for a moment. HEAVEN CANNON ⇒ RISING KNEE ⇒ ⇒ BULLET CUTTER. HEAVEN CANNON ⇒ RISING KNEE ⇒ ⇒ HEAVEN DANCE. The second one looks very aggressive and is good for ringing out, because it juggles a farther distance. You have more control over this juggle, and if you delay the last part, you will send them even further and hit them on their side while they're just a few inches above the ground. If the opponent is a pro and knows how to escape, then only one or two hits will connect and you shouldn't bother launching them again. HEAVEN CANNON ⇒ CLOUD DIVIDE ⇒ CLOUD DIVIDE ⇒ ⇒ OBEDIENCE. + (Launcher) → + → + → → ~ . TROOPER ROLL ( + ): This move is very good because it rolls in close to opponent and stabs under any high attacks. 6 DEADLY STRIKES: While in 8 way run( or ), perform PEAK OF FLAMES ( , , ) then go into SHIN SLICER ( + ) ⇒ CLOUD DIVIDE, COLD STITCH ( + ). The PEAK OF FLAMES is 3 different strikes at different angles which normally gets in close to the opponent. The last hit doesn't always connect, but looks very aggressive and forceful. While in 8 way run( or ), perform PEAK OF FLAMES FEINT ( , ) which gets in close to the opponent, then throw them straight after. Try getting close and SPLITTING GOLD ( + ) ⇒ throw. The first hit stuns the opponent so a throw is likely but you must be in close. + ⇒ + ⇒ + ⇒ WS+ ⇒ throw. This gets in close and pokes the player, which is good, because it forces them to block so you just throw them. Use this technique a lot when fighting Xianghua players. Mitsurugi can poke too. Once the opponent has been knocked down, they are considered "floored." You can follow up with a ground hit, but that is what most opponents will be expecting. Alternatively, you can wait until they rise, which may result in a more successful hit, as it is less expected. If they're caught off guard, you can sometimes win the round with a series of attacks in a row. All moves assume opponent is floored. Run right up close to opponent and when he/she is about to get up perform STALK SHAVER ( + ). Run close to opponent again who will no doubt be blocking low and perform BULLET CUTTER ( + ) and keep alternating. Run right up close to opponent and when he/she is about to get up execute BULLET CUTTER ( + ). Run close to opponent again who will no doubt be blocking high and execute STALK SHAVER ( + ) and keep alternating. When they are about to get up perform SHIN SLICER ( + ). While they are still laying down perform a delayed HEAVEN DANCE ( + , pause, ) and keep alternating. While they are still laying down execute a delayed HEAVEN DANCE ( + , pause, ). When they are about to get up execute SHIN SLICER ( + ) and keep alternating. Immediately carry out HALF-MOON SLICE ( + ) which cannot be blocked but can be interrupted. It's very cheap but even top professionals fall for it at least once a round. This strategy only tends to work if your opponent is a quick riser. If your opponent likes to lie down for hours, then just keep doing STEEL SLICER ( + ) or COLD STITCH ( + + ) which does high damage and wakes them up. If your opponent is at the edge of the ring, then the best way to knock him/her out is to carry out a juggle or keep walking around them in an 8WR and perform BULLET CUTTER ( + ) or STALK SHAVER ( + ). When you get knocked down, then instead of mashing all the buttons to get back up again, there is actually a strategy to rising. Providing you are lying near the opponent, then press Guard+ or Guard+ to quickly rise with a throw. If you are lying mid-range or far from opponent then quickly rise with a BULLET CUTTER by holding back and pressing then . Supposing you are floored at the edge of the ring, then roll around on the floor until the opponent is between you and the edge, then quickly rise with a BULLET CUTTER ( + ) and hope the opponent falls out of the ring. Supposing the opponent only has a little bit of energy left, then keep tapping ... or ... or ... There's no point in doing a big move. If the opponent parries, then try parrying straight after. If the opponent blocks too much, then move around them in an 8WR and keep repeating BULLET CUTTER ( + ). In other words, keep dodging them. If the opponent keeps moving in an 8-way-run, then use SUDDEN GAIL ( + ), which ends any 8-way-run game and maybe go on to tick them into a throw. If you ever find yourself in a situation where your opponent has spent all his/her money trying to beat you and everyone else is too scared to challenge you, then you'll have to, unfortunately, fight against the CPU. You can use this opportunity to either show off, attract new human opponents or complete the game in the fastest time and get to enter your name. This technique is a series of four different unblockable moves for an inescapable string that ends the round. The SPIRIT CHARGE makes the STEEL SLICER un-blockable. After the last attack the CPU will KO. To make this series look even cooler, finish off with a throw like AUTUMN REQUIEUM ( + ). This must be the fastest way of winning the round. Again, finish off with a throw to look cooler. The CPU is absolutely helpless against the unblockable series. You are guaranteed to get on the score board for the fastest completion. Just use the same string every round.